I'm sure by now you've already heard of the wonderful powers of pearl powder. 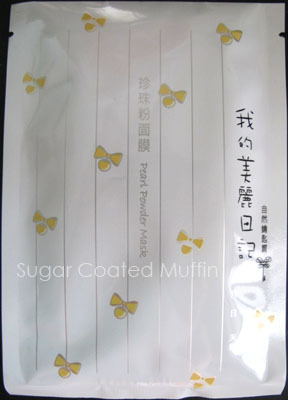 This MBD mask has pearl powder inside for whitening & toning. Packaging's cute as usual ^_^ I faced one big problem with this mask. The perfume!! It's too much especially for something you place on your face for 15 minutes =_= I'm kinda having a headache now cos of it. 15 minutes seems like a long time. I would remove it if it weren't such a waste. The sheet feels very moist, just like the other masks from the upgraded version. However, it doesn't feel as moisturizing as the previous ones I've tried. Skin's soft and very smooth. My face does look temporarily brighter but that's it. I thought the same as you with this mask, the perfume!